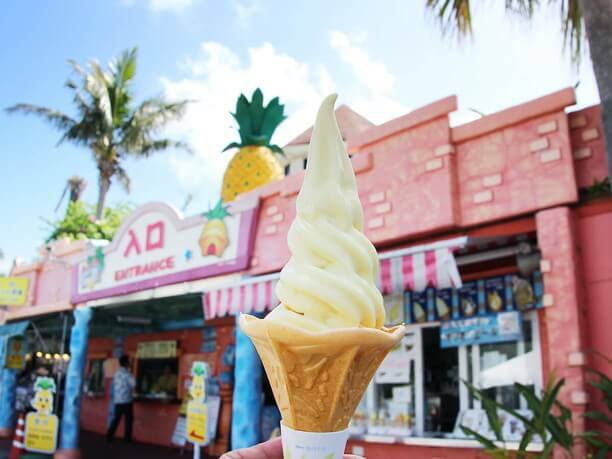 Sample all the pineapple food at Nago Pineapple Park! 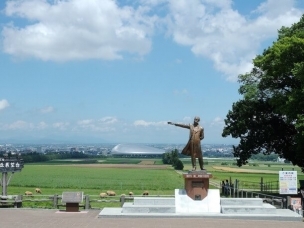 Located in Nago-city is “Pineapple Park.” The entrance fee is 600 yen for adults, and 300 yen for children (August 2015). 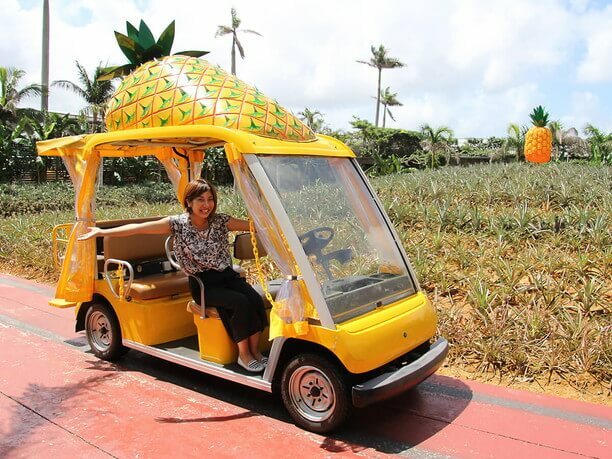 You can ride in the pineapple shape cart and see all the subtropical plants and visit the seashell museum and wine factory. 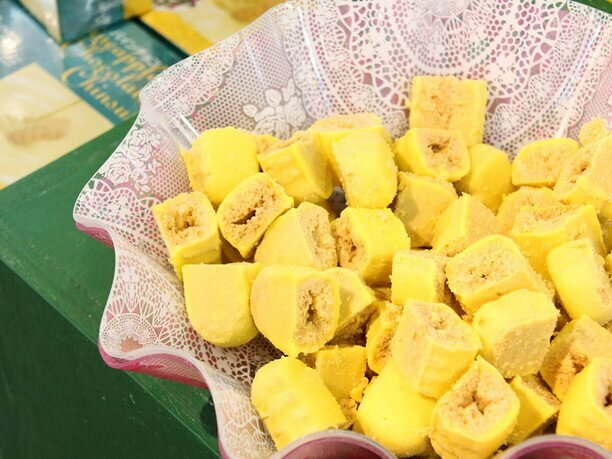 In the shop you can eat raw pineapple and sample all the different foods made with pineapple. There are lots! You can definitely eat enough to make up for the cost of the entry fee. Please do not touch the steering wheel! The pineapple cart is on automatic pilot. First, finish the registration and you will be directed to the pineapple garden tour cart. Travel time is approximately 10 minutes. 4 people can ride at once. It is on auto-pilot, so no driver is required. 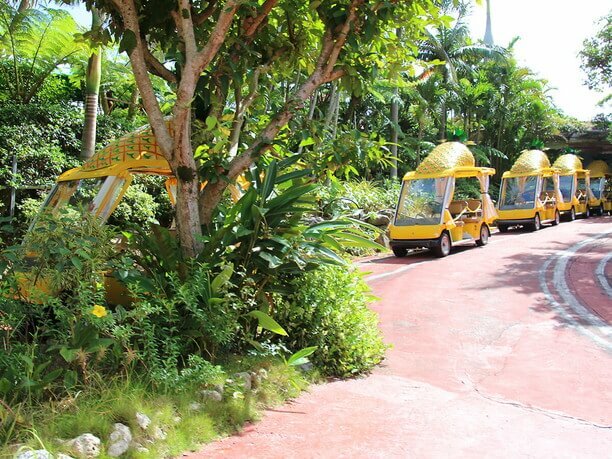 You will be driven through the inside of the pineapple fields and subtropical plants. When you get off at the end, start walking down the path. First, you will come to the seashell museum, then to the wine factory. 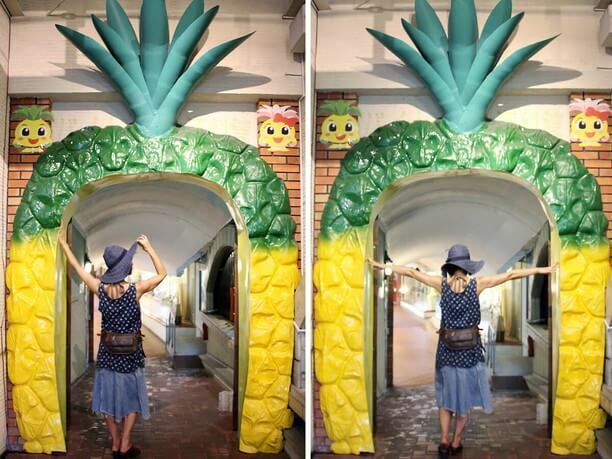 Then you will see a big pineapple entrance.If you are brave, you can have your picture taken here. Eat as much pineapple food as you want! Upon entering the shop there is the first tasting corner. 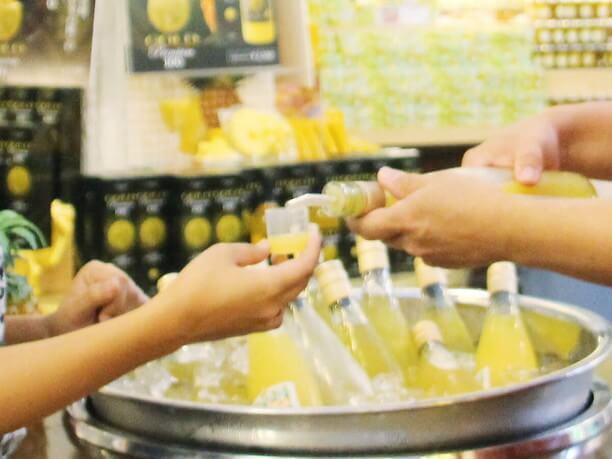 Here you can sample pineapple wine and juices. There are many types of drinks including a very healthy drink using vinegar. Please notice the tasting cup in the photograph! It is a tiny sampling cup. So you may need 10 or more cups of the drink. Feel free to have as many as you would like! And the tasting corner that follows is fantastic! It has samples of the sweets manufactured at the park. There is pineapple pie, cake, sponge cake, tarts, and cookies. There are more than 10 different baked goods to sample. If you plan to go in the morning, please don’t eat so much that you won’t have room for lunch. Same thing goes for an evening visit. If you eat too much you might not have room for dinner. Yes, it is the real pleasure of this trip. So since you are on vacation why not enjoy yourself now and don’t worry about your next meal. After that comes the tasting of the long-awaited fresh pineapple. There is word of a pineapple diet, maybe just eating pineapple will keep you from getting fat. No matter, don’t worry about if anyone is watching. If you want you can enjoy a whole plate of pineapple by yourself. And when I thought I finally arrived at the exit. There was mozuku udon waiting there! Is your stomach full from tasting or do you still have room for pineapple soft serve? Popular pineapple soft-serve ice cream and sherbet. I want to eat this popular cold treat immediately if it is midsummer. In the heat of Okinawa, the ice cream will only keep its shape for about 1 minute. 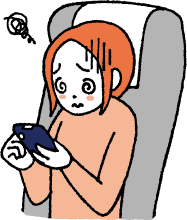 Then it becomes like a waterfall which flows out towards your fingers or the ground. On a hot day eat it immediately! That’s the trick. 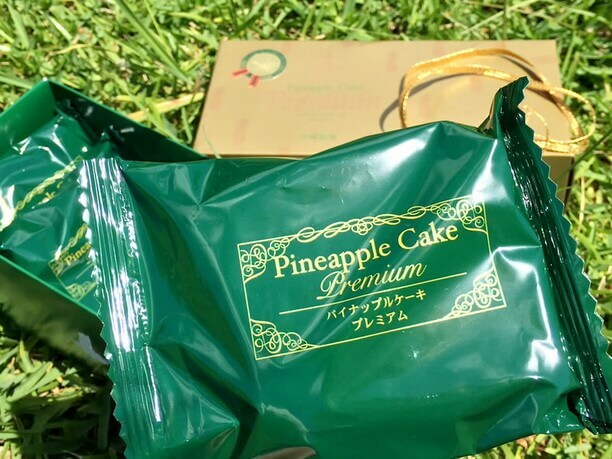 Each piece of “Pineapple cake premium” is wrapped separately! This cake was selected for 5 consecutive years for the Monde Selection, Gold Award. What is it exactly that made this cake the winner of the Monde Selection Gold Award? I tried to answer that with an actual taste. 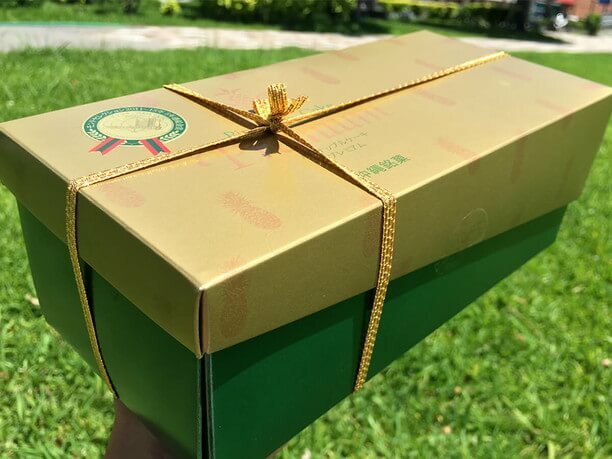 There dark green box with a feeling of luxury has been decorated with gold ribbon. When I attempted to open this luxury box with a tied on lid, I found the gold ribbon was actually not a ribbon. It was just a rubber band. In other words, it can be opened easily in 6 seconds or less. It is tastefully packaged in a dark green classy wrapper. I think the theory of a dark green and golden collaboration to produce a gorgeous package was born here. 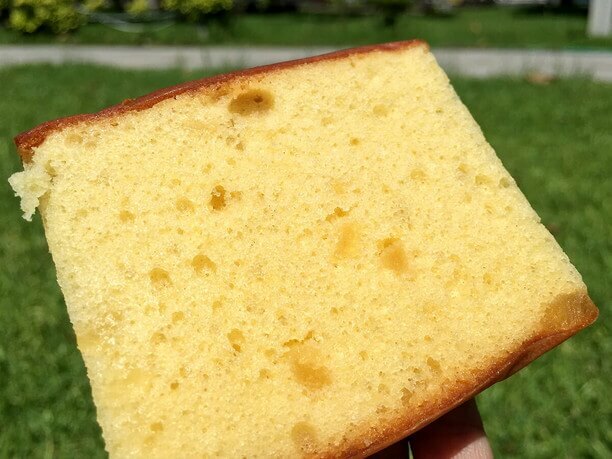 After tasting raw pineapple in the store, it is best to try “pineapple cake premium” later (on an empty stomach). 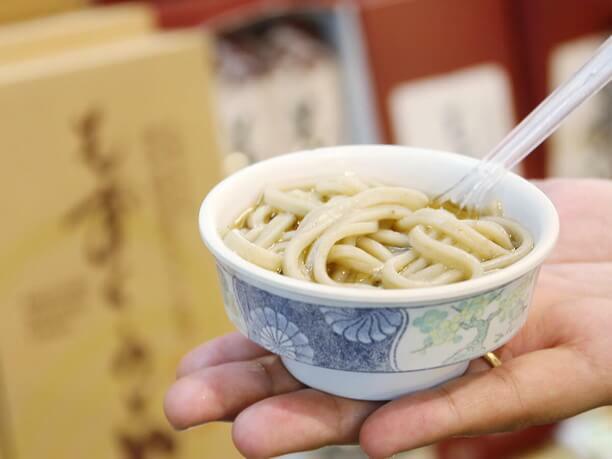 "Nago Pineapple Park" is located on Izumi Road in Okinawa where there a lot of soba shops. So after a good lunch of "Okinawa soba," It is only a 1-minute drive to the OKINAWA fruit land! Shops are all along the route. So that you don’t forget to buy any souvenirs, be organized. Buy what you want when you see it. The register might be crowded when you go back. Remember, the soft-serve ice cream and sherbet are waiting. Leave room in your stomach! 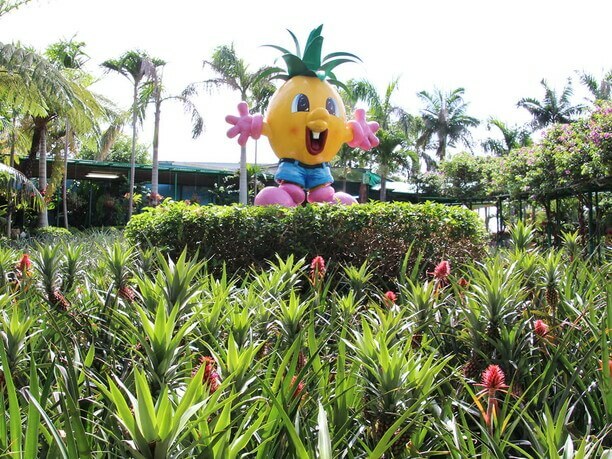 Nago Pineapple Park is a good tourist and souvenir spot. 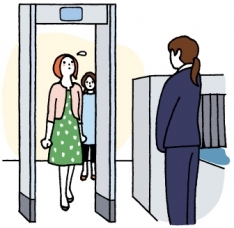 You need about 60 minutes to enjoy the visit. There is a lot to drink and drink. You may want to say no to some, but do your best to enjoy yourself. * Younger than 6 is free of charge. 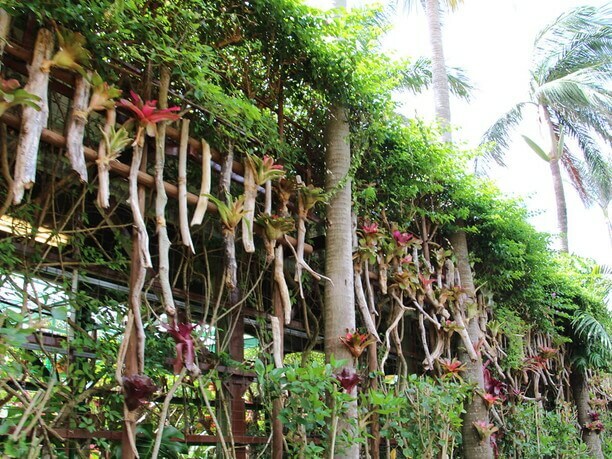 Amazing “Neo Park Okinawa” (located in Nago City) is a different kind of zoo! 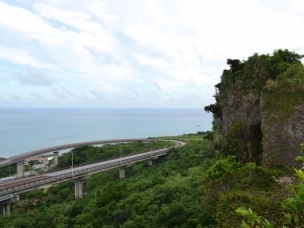 Top 10 Best Tourist Destinations Of Okinawa! Come play at Okinawa World, Southern Okinawa’s maximum experience theme park!